Our experience covers semi-automated bulk bagging systems, sequential batch control, parallel batch blending, loss in weight systems, check weighing, bin weight measurement and special-purpose dosing systems. We will design customised systems with varying degrees of automation to suit the client’s requirements. 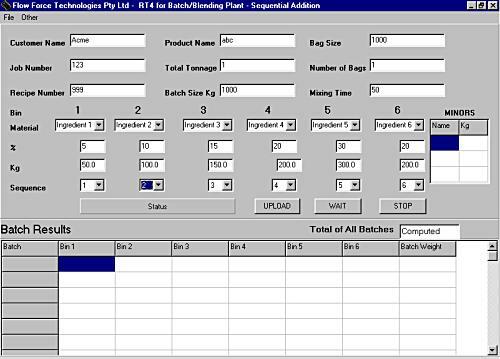 Our RT4 PC terminal software interfaces with PLC’s to provide flexible, operator friendly set-up and control of process recipes for batch weighing or blending applications.